A group of MPs headed by Vice Speaker of the Azerbaijani parliament, head of the Azerbaijani delegation to the OSCE Parliamentary Assembly Bahar Muradova will take part in the annual session of the organization in Berlin, Germany on July 6, the Azerbaijani parliament said in a message July 4. The delegation consists of Vice-President of the OSCE PA Azay Guliyev, MPs Ulviyya Agayeva, Tahir Mirkishili, Elshad Hasanov and Kamran Nabizade. The agenda of the session will be approved, reports on the activity of special representatives will be heard and proposals on making changes to procedural rules will be considered at the meeting of the OSCE permanent commission. The issues on OSCE commitments in the military and political spheres, ways to resolve conflicts, fight against terrorism, climate change, the impact of conflicts on the environment, the development of digital technologies, human rights in emergency situations, the rights of refugees and migrants will be discussed in the committees of the organization. 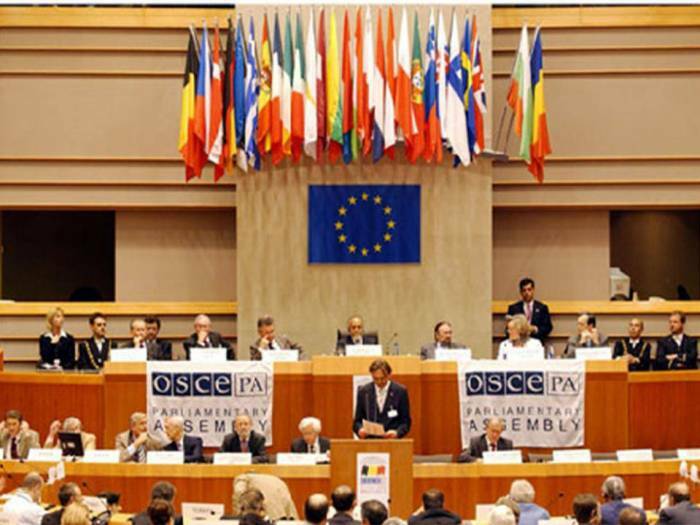 The discussions entitled "Fulfilment of commitments within OSCE: role of parliaments" will be held at the session. At the event, the Azerbaijani side will present the draft resolution "Development of transport networks, including strengthening of interconnections in the OSCE region through the restoration of the Great Silk Road". A number of resolutions will be also adopted at the meeting. The members of the Azerbaijani delegation will deliver speeches on the certain issues and express their opinions. The visit will end on July 13.